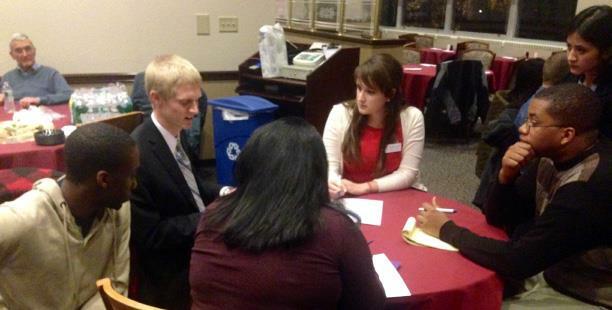 Enthusiasm and excitement emanated from the 26 attendees at the Seton Hall Leadership Fellows Program Kickoff Event held on February 10, 2015. Seniors campus-wide were selected to participate in the program based on their significant student leadership positions or experiences. “I believe it’s a great idea which brings powerful and strong leaders together,” said participant Chris Gbogi. Over the course of five sessions, the Seton Hall Leadership Fellows Program will provide participants with the unique opportunity to connect will fellow student leaders from all of the schools at Seton Hall. Innovatively, the Kickoff Event served as a planning meeting where students indicated the aspects of leadership they wanted guest speakers to address at upcoming seminars. In the forthcoming seminars, participants will be eager to explore three central facets of leadership, according to Maggie Bach, the Assistant Dean of Students for Leadership Development. Firstly, students would like guest speakers to describe the roles of a leader and how a leader manages crises and daily responsibilities. Next, students would like to discuss effective ways to demonstrate leadership skills in their new careers. Finally, participants seek to learn the communication and conflict resolution skills of a leader. After the successful launch of the Seton Hall Leadership Fellows Program, participants and coordinators expressed optimism about the program’s trajectory. The Seton Hall community is looking forward to the future of the program and where it is headed. In the end, everyone hopes that the selected students will be able to have these unique experiences and expand on their leadership skills.